How can you find more work? 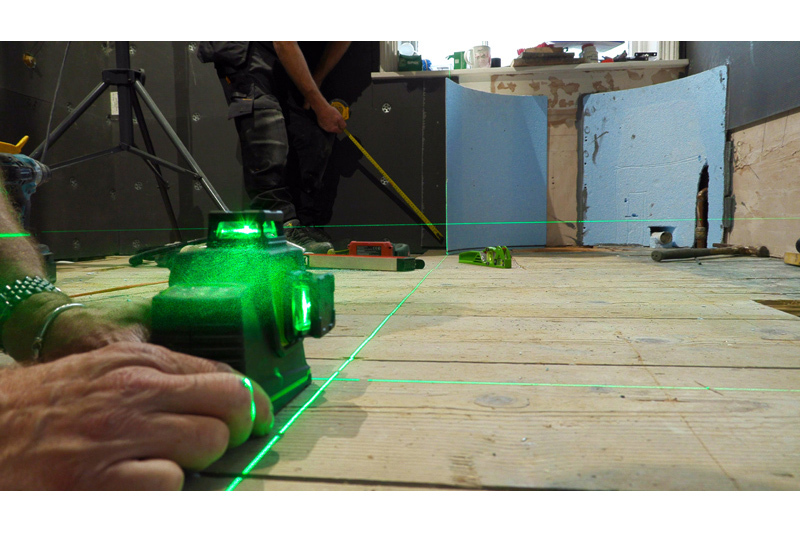 We check out the Imex green beam laser level with USB charger. Laser levels are a must-have tool for most trades these days, but the red beam can be very hard to see in bright light, and the beam intensity drops off dramatically over distance. Green beam lasers cost twice as much, but they offer twice the performance and, once you have grown accustomed to the green, it is hard to return to the red. Of course, you can increase the range of any laser with a target or a detector and, unless you are working indoors all the time, you will probably need a detector at some stage – unless, like me, you return to site when the sun goes down to do the setting out and establish datum lines. Having sad that, in bright, cloudy (but not sunny) conditions, you can often manage with just the target. If you are comparing it to a bog standard cross hairs, this may be a pricey laser, but compared to a rotating laser it is dirt cheap and, to my mind, it is a better tool because the 3 x 360° lines with an off-set for the up and over beam give you three uninterrupted lines simultaneously, which the rotating does not. Add to that the battery life is better when you don’t have to spin a motor. The battery on this unit gives an amazing 45 hours on a single beam, and around half that on the three beams. It comes with a rechargeable Li-ion and a holder for alkaline batteries so you have options. I am very careful with laser levels, and almost obsessive about locking the pendulum when I move a level, but I often wonder how it would survive if it happened to be dropped. I wasn’t about to try it but Imex says it is the group winner in a 1m drop test. What they don’t say is whether it was locked at the time. The lock is a great thing and I was amazed to find that not all laser levels have one, but it can also be a curse. I loaned this to a tiler for a week and he made the schoolboy error of taking a line with the pendulum locked. The trouble is that it was so close to being level he didn’t notice it until he had four tiles up and stood back. This is one of those things you learn quickly, and the difference with the swinging self-levelling line is very obvious once you know. However good a laser is, I know I am not alone in instinctively reaching for my spirit level just to check when I am using a laser level. A second opinion is always welcome, particularly when the cost of getting it wrong can be an extra half a day of time wasting rectification. We have all been there and it is such a nice feeling when you put the spirit level up and it is spot on. WATCH: Snickers Floorlayers Trousers… TESTED! What are your van priorities?